Wake up every morning to a beautiful waterview as a guest in this spacious apartment situated in the island-like district of Steigereiland. Boasting a slick white decor and oak floors, this modern apartment includes a double bedroom and a twin bedroom. Read a book in a large hammock, or just simply relax and enjoy the view. The kitchen is fully-equipped. You get 120m2 space to relax after a busy day in the city of Amsterdam. A key to the apartment will be provided so you are free to enter and leave the place whenever you like. There is a tram stop in front of the apartment complex, which brings you to the Central Station within 10 minutes. The A-10 is just minutes away. You can park in front of the building, parking-fee until 19:00 hours. Next to the apartment is a small neighborhood store, a five minute walk will get you to the mall with an Albert Heijn supermarket, butcher and pharmacy. In the summer you can swim in the area, its within walking distance of a children's beach located at the Diemerpark and within 10 minutes lies the big city beach called Blijburg. On the island are some good restaurants where M'Chi is an absolute must to visit! From the hall, you can reach all living areas. At the right side you find the separate toilet, built-in storage (including the washer and dryer) and a bathroom with shower. On the left there are two spacious bedrooms. At the end of the hall you have access to the living room with open kitchen. The in 2009 completed open kitchen is equipped with Bosch appliances, including a dishwasher, fridge, separate freezer with 3 drawers, combi microwave oven and ceramic cooking. Other appliances involve a water-boiler, grill and coffee maker Senseo. When you have small kids we can provide special furniture as a box, childrens-chair etc. Please give us advance notice when you make your reservation! The house has an oak floor in all rooms, with the exception of the bathroom and the toilet. The apartment is characterized by the light through large windows, the unobstructed view over the water and a spacious living room (approx. 43 m2). The bathroom has a sink with large mirror and a shower cubicle. There is a seperate toilet in the apartment. In addition to the big living room, you can also enjoy the view from the spacious loggia. Read a book in the hammock and if you want to sleep for a while you'll manage that as well! To ensure guest safety we have outfitted the apartment with a smoke-detector, fire-extinguisher and fire-blanket, and a fully stocked first aid kit. You can make free use of all facilities in the apartment. Pets are usually allowed after prior consultation. No smoking in the apartment please. Next to the front door is a hallway leading to the stairwell where you have free space to smoke. At the apartment an extensive brochure will be available with information about the apartment, surroundings and tourist options. Please note that due to our apartment being located in a residential complex we have set houserules to prevent disturbance to other owners in our building. We are orientated towards families as our area is very childfriendly and offers a nice more relaxed atmosphere than the busy inner center. As we like to keep the good understanding with our neighbours we do not allow stag parties and groups that are made up of just people under 23 years old. Easy going, enjoying life.. family-man with a beautiful wife, 7 year old son and 3 year old twin boy and girl! Amazing view over the river and lake while being connected to all hotspots of Amsterdam! Lovely, comfortable apartment, would definitely return and recommend. Striking apartment with stellar view!! We loved the apartment! It was very clean, big windows, and very spacious! It had everything we needed. Our favorite room was the sun porch where we would sit every morning to enjoy our coffee. From there you could watch the tram, bikes and people coming and going. Harold and Tamara were wonderful hosts, responding to us quickly when we had questions. We highly recommend this apartment and would definitely stay here again. Thank you for sharing your apartment with us! Good communication from Harold and a very warm welcome from Tamara turned a really good apartment into a great base camp. Plenty of space to relax after a day in the city and all the kitchen you’ll need to eat in if you choose. Tram stop just 50 metres from the front door and only 15 minutes into Central Station. A really good find - perfect to come back to after a busy day in the city. Right next to the tram stop, and very easy and cheap to park nearby using the P&R system. The apartment is spacious and light and there were good facilities for self-catering. The kids felt very welcome and we all had a great break. Harold and Tamara provide a clean, well-equipped, spacious apartment. Very conveniently located to the tram and grocery store, quiet at night, kid-friendly. Loved that they provided lots of info about Amsterdam sites and the ABCs of the apartment, area, transportation, check-out in a convenient binder. Highly recommend. Fantastic location, awesome views, super clean place! Loved the location! Right next to the tram to town. Out of all the noise but very easy access to the action. Lovely space with comfortable beds, nice size bathroom, great kitchen and superior Wi-Fi and TV. Our train was delayed over 2 hours and Harold waited up for us! Would stay here again in a heartbeat!!! 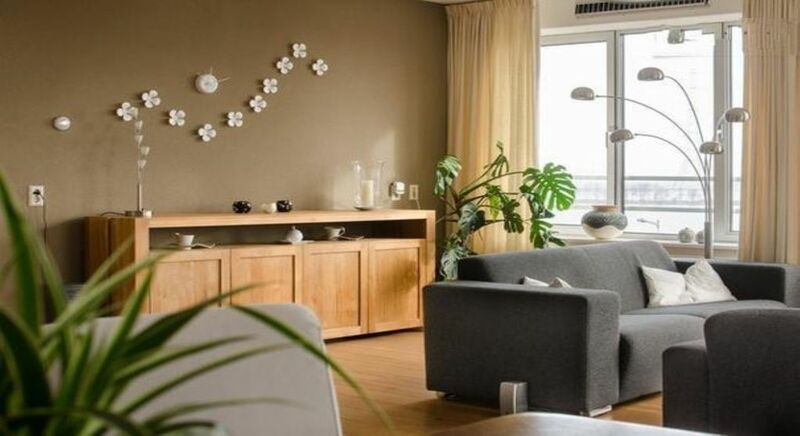 Our apartment is situated in the most modern part of Amsterdam and thus offers a clean and relaxed atmosphere. As a residential area its orientated towards young families while its excellent connection to the center by tram will get you to touristic hotspots in little time. E.g. from our apartment its only a 10 minute ride to reach Central Station.